I am a big fan of Fair Trade products, and Stephanie over at Fair Trade Designs was kind enough to send me some of their products to review. One thing I really like is the stories about each of the artisans, so you really get to know the people behind the products you are purchasing. Fair Trade Designs jewelry is sourced from all over developing countries and are made from a wide variety of eco-friendly and sustainable materials including seeds, recycled glass, and even paper. Here is a sampling of some of their wonderful products and stories. 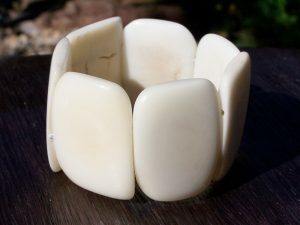 Rainforest jewelry from Ecuador – The tagua nut fair trade bracelet comes from Ecuador and grows on a species of South American Palm. This eco-friendly cuff bracelet is handmade from “vegetable ivory” which is shaped, polished, and naturally dyed, giving it a distinctive smooth, cool feel. It is a great earthy and robust feeling piece, with more character and flair than the plastic counterparts you see in jewelry and fashion stores. There is a long history of using rainforest seeds to create jewelry in Ecuador, however there is no real export market to sell their jewelry. Artisans are unable to live from their craft and their jewelry is rarely seen outside the small villages in which they originate. Fair trade makes it possible to receive business training, workshops in design, and of course a fair wage and good working conditions. Their lives have been and continue to be transformed when you purchase their products. Trees are not harmed and the commercialization of these seeds helps to ensure the survival of the world’s rainforests by providing an alternative income for its inhabitants in place of logging or selling their land to destructive industries. Through a manual, low energy process, seeds are transformed into beads, which have sculptural natural irregularities, both in color and form. Recycled glass bead necklaces from Kenya – The beads in this necklace are handmade from discarded bottles and spun into simple 2-strand necklaces, bracelets and earrings. This particular necklace is decorated with silver-tone giriama beads. Hand crafted by one of 21 men and women working in Nairobi, each employee is paid a very fair monthly salary in addition to receiving between 5% and 15% of the wholesale price of each item they make. This way, they receive both a regular monthly salary and income throughout the month. Because of this, the workers earn 5 times more in wages than the national average in Kenya. Most medical costs for the workers and their families are also covered and they are provided a daily lunch. When I first handled this necklace, I was confused by the material. It was lightweight, yet durable, and I thought for sure they must be from a seashell or lightweight ceramic. In fact they are handcrafted from local market paper waste of calanders, magazines, posters and cereal boxes. The beads are hand-rolled by women artisans in Northern Uganda from long strips of paper, sealed with an eco-friendly glaze and hung to dry in the warm Ugandan sun. Pronouced “mah-daa-la”, the word originates from the Luganda word, ladder. It is made to symbolize the ladder that these women have built to lift themselves out of poverty. The sale of these beads and jewelry supports Bead for Life, a non-profit organization devoted to improving the lives of women in northern Uganda. The artisans are impoverished, hardworking and intelligent women with a strong desire to improve their lives. 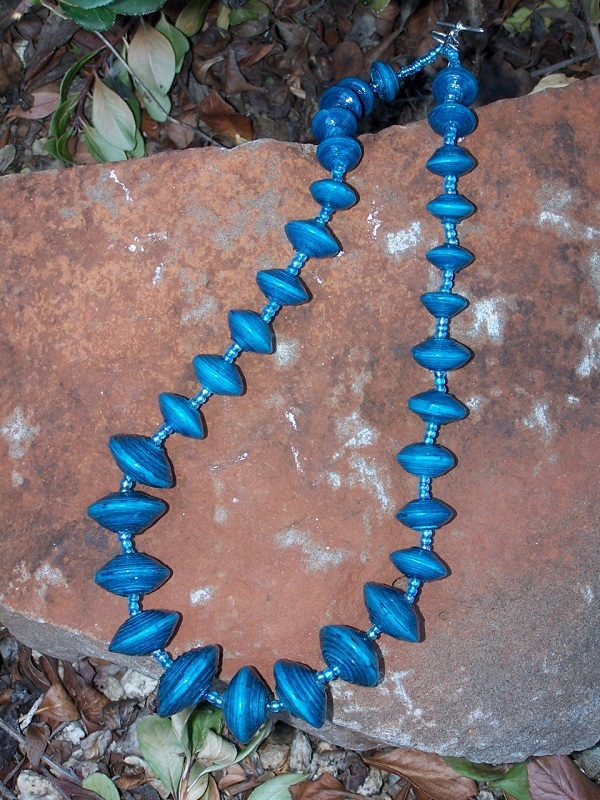 They live in Kampala and Iganga and make beautiful handcrafted paper beads from recycled paper and turn them into necklaces, bracelets and earrings. The goal of Bead for Life is for its artisans to be independent of Bead for Life within 18 months by being able to support themselves within the Ugandan economy. They sponsor community development projects in health, vocational training for impoverished youth, affordable housing, and business development. To assist members in launching their own small businesses or in creating new revenue streams, they provide entrepreneurial training, facilitate savings accounts, and make business funds available. The women generate a regular income of about $280 a month, equivalent to a teacher’s salary in Uganda. Over 1,000 women have gone through or are currently enrolled in the bead rolling project. Each woman supports an average of 8 people. 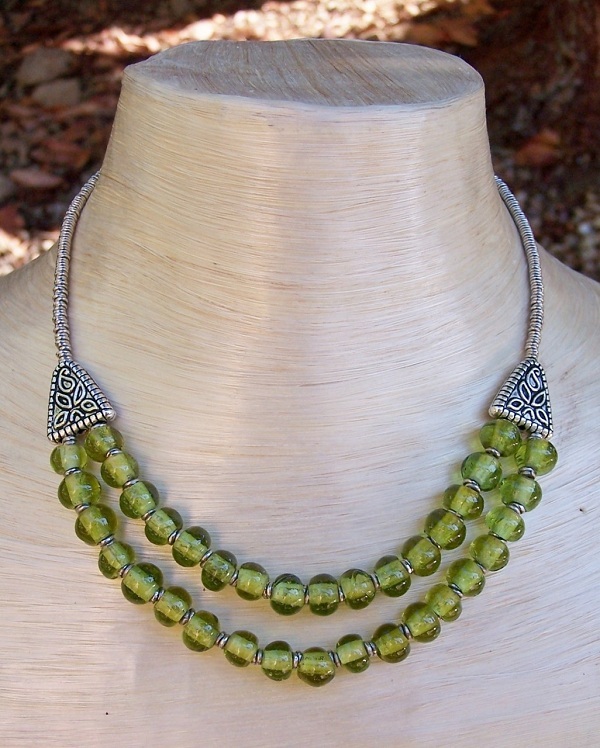 Head over to Fair Trade Designs website to check out their large selection of fair trade jewelry and other housewares.